Throughout recorded history, oppressed groups have organised to claim their rights and obtain their needs. Guiris, who have been oppressed by physical violence and by ideological and economical attacks at every level of social interaction, are at last becoming angry. To you, our tourist sisters and brothers, we say that you are oppressed; examples of the hatred and fear with which native society relegates us to the position and treatment of sub-humans are seen every year in all countries: Tourist traps, high priced coffees, native rudeness, wrong directions given, scams, robberies, non VISA accepted, etc. We are doing them a favour and they treat us like this. That’s why we are angry. That’s why we can use our righteous anger to uproot the present oppressive system with its decaying and constricting ideology. Before we can create the new society of the future, we have to defend our interests as guiris here and now against all forms of oppression and victimisation. We have therefore drawn up the following list of immediate demands. that all discrimination against guiris, male and female, by the law, by employers, and by society at large, should end. that all guiri who feel attracted to a member of their visiting country be taught that such feeling is perfectly valid. Uneducated musical and art taste is not a matter of discrimination. Preferring «It’s a Long way to Tipperary», «Douce France», «Zorba’s dance», or «Little Frank –Paquito– the chocolate maker» it’s a proof of our sensibility. that natives stop treating tourism as though it were a sickness, thereby giving guiris senseless guilt complexes. that guiris be as legally free to contact other guiris, though newspaper ads, on the streets and by any other means they may want as are natives, and that tour operators harassment should cease right now. that employers should no longer be allowed to discriminate against anyone on account of their dressing and intellectual or fast food preferences. that guiris be free to take pictures with flash, in public and private spaces, as are the natives. that we are not born guiri. We choose to be guiri. So, don’t say we get out from a closet, instead we get out from the souvenir shop. 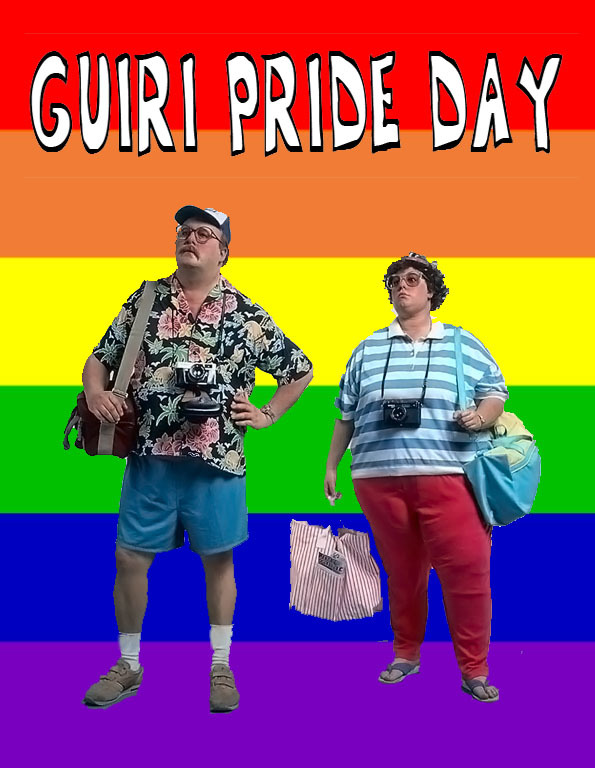 August the 15th will be the GUIRI PRIDE DAY. We will travel to your country in gay dresses; We, from all ages and genders, will parade your streets in buses, we will overflood your city centres, hotels and B&B; we will make prices rise, we will give you our kindly tips, we will burn our skin at the beach, we will get drunk for your enjoyment; we will wave our cameras, cool hats and shirts, credit cards and museum tickets, to show you with pride that we are different, dress different, speak different and pay different. Esta entrada fue publicada en Prosemas, Todo y etiquetada Barcelona, Duane Hanson, gay, Gay Liberation Front, Guiri, history, paquito, pride, Saachti, Spain, tourism. Guarda el enlace permanente.